“Though early, the album has the makings and momentum to be a classic for the genre.” Phrases like this are common in PR texts, so much so that they rarely evoke more than a smirk. Especially if such big words are used to describe the sophomore album of an artist hardly known outside of the US. Phrases like this usually only point out one thing: that the author of the text knows rather little about writing decent PR texts. In some cases, however, you realize after having listened to the correspondent album that the author was simply right. Mighty Mystic was born in the parish of St. Elizabeth, Jamaica, but moved to Boston, MA, (USA) at an early age. Having sung his entire life, the success of his older brother Stephen in the local hip hop scene encouraged him to think about going professional. In 2006, the single Mighty Mystic had produced with Mike Cip (Split2nd Ent), Riding on the Clouds, rose expectations considerably. Four years later, he was back with a first album, Wake Up The World, that peaked at the fourth position of the US iTunes reggae charts. 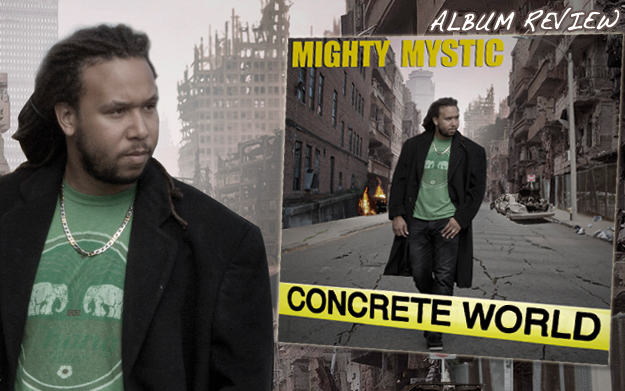 Being an established part of the US reggae movement now, Mighty Mystic is back with Concrete World, his sophomore album already proclaimed a classic by the accompanying PR text. The first thing I noticed about Mighty Mystic was not the fact that he is the brother of Andrew Holness, the former Prime Minister of Jamaica and now the leader of opposition, nor the braggy language employed in the PR kit that came along with Concrete World, but the outstanding musical backgrounds of the members of his band, the Strings of Thunder Band. Founded by guitar player Stephen Holness - the aforementioned brother of Mighty Mystic -, its other members are bass player Marc Smith, drummer Brent Sirois, who holds a degree from Berklee College of Music, Jamaican-born multiinstrumentalist Koga Rite on organs, saxophone, mbira, and backing vocals, and percussionist Doug, an avid collector of “world music” and also an alumnus of Berklee. Musical influences are manifold here, and the skills are certified in ink. Individual members of the Thunder Band, the entire band, Mighty Mystic himself, and Mike Cip are mostly listed as the producers of Concrete World. Family efforts like this one often risk to sound too diversified, lacking a musical leitmotif that keeps things together. In the case of Concrete World, Mighty Mystic and Mike Cip did a good job of unifying the various ideas, plus you hear the experience of years spent touring together that much smoothes the recording process in studio. Concrete World’s foundation is modern roots, but hip hop influences are omnipresent, often building the structural base of the songs that get further refinement through rocky guitar licks that much characterize Mighty Mystic’s signature sound. Put a good deal of pop on top of it and add the much 2014-sounding, confident yet very directed use of synthesizers, and you know that when he sings “We are the new generation” (Next Generation), Mighty Mystic considers himself a part of a new musical generation also. His songwriting never tries to conceal the background of an alternative middle class experience in an urban, North American setting with all the (non-)problems that come along with it. No asserted ghetto stories here, but honest accounts of Mighty Mystic’s own experience, wrapped in words general enough to allow for maximum identification. Concrete World comes with mainstream appeal, both musically and lyricswise. Almost all recent reggae success stories involve an artist that doesn’t shy away from stretching the “boundaries” of the reggae genre. Concrete World is an eclectic album of cutting-edge quality that manages to keep a distinct reggae feel to a surprising extent. It is a blueprint for contemporary modern roots, one that could define 2014 - if it gets heard.